ászlo Jozsef Biró, the man who invented the first fully functional ballpoint pen, didn't like the American way of doing business that much. One day Biró bought a car, a red Bugatti but he was dissatisfied with the car's gearbox and within a year, he had developed, built and patented the automatic gearbox. Since he was by no means a rich man he decided to sell the patent. He signed a contract with General Motors where he was offered an advance on 12 000 U.S. dollars in anticipation of the big money. However GM decided not to pay the licence fee and kept the agreement hidden way down in their archives. Not ready to act on the new invention. Since Biró had already received the advance he was unable to re-sell the patent, nor develope i further. So that deal never served as a pension insurance for Lászlo Biró. No, he didn't like the American way of doing business after that. ászlo Jozsef Biró was born in Hungary, some sources say 1899, others 1900. He had studied to become a physiscian and had additional carreers as a journalist, hypnotist; sculptor, painter and inventor. But the inventions attracted him the most. He went on to invent, among other things, the heat-resistant clinker, a blood pressure meter, and his thoughts constantly revolved around new inventions. He had, over time, acquired a fundamental distaste for fountain pens, and Lászlo had, together with his brother George tried to invent a completely new kind of pen. One that didn't randomly squirt ink, and didn't have the expensive gold nib. he very idea of the pen was simple: a small ball would fetch ink from an ink container, spreading it evenly through the front. Yet it took over 60 years to make it really work. The American John J Loud received patents for a ball-point pen already in 1888. But it had several shortcomings. Among other things, one had to write with it straight up or it would skip. In the thirties two Czechs, Eisen and Kliemes, also produced a ballpoint pen named Rolpen. During World War II Kliemes was sent to a concentration camp and the production stopped. iró, who lived in Budapest, from time to time went on holiday to Lake Balaton, and once he made the aquaintance with another man who also was there on holiday. Soon Lászlo started on his favourite topic of pens and managed to catch the interest of his new friend. The friend turned out to be the president of Argentina, Augustine Justo. He invited the Biró brothers to Argentina and gave them the opportunity to launch a pen factory. he brothers were first quite reluctant to accept this ambitious offer, says Henry Gostony in his book The incredible ball point pen. But by the outbreak of World War II the brothers decided to move. In 1940 they travelled to Buenos Aires. produced it was called the Biróme. But unfortunately it didn't work very well. Biró began to feel the pressure. His largest financier, Henry Martin, had strong links to the British Air Force and Martin saw the Air Force as a potential customer, because the fountain pens had the flaw that they were no good at high altitudes and couldn't handle the changes in ait presseure. He was constantly on Biró, demanding results. n 1943 the new Biró pen was ready. It worked so well that Henry Martin asked to buy the patent. Well, Lászlo Biró should have learnt from his past mistake with the gearbox, but he decided to sell. Soon, Martin sold 30 000 pens a year, many to the British Royal Air Force. The price was a breathtaking two pounds per item. Birós pen worked on high altitudes, almost in any climate at any time, and contained a whole lot of ink for prolonged writing. Unfortunately Biró didn't gain much from the sales. Parker, Eversharp and Sheaffer. They made it clear that if any of them managed to produce a better or as good a pen as Biró, they Department of Defense would ensure good business. Well Biró filed his patent in most of the Western World, including the Soviet Union, but for some reason he had forgot about the United States. versharp discovered this and immediately started to lease the patent for the U.S. market and began to work on its own design. Almost simultaneously an American businessman from Chicago, Milton Reynolds, got wind of the new wonder pen. He even flew to Buenos Aires to get hold of the patent, but to no avail. This didn't discourage him at all so in spite of the shady legality he started in 1945 to produce his own pen. Through a massive ad campaign he managed to convince the American people that his pen, The Reynolds Rocket, was nothing less than magical. He charged $12.50 for it. The only magical with his pen was however that it sold in several million copies although it did not work properly. merica had entered a ballpoint frenzy. Everyone wanted one and at one time more than 150 companies were making ballpoints. They were all selling more than they could produce and in an effort to keep up the sales even Eversharp, who actually had the Biró patents and could have made fully functional pens, produced an sold it's own low quality ball-point pen, the Eversharp CA, with poor functionality. Millions and millions of ball pens were sold. But in the late 1940s the users had gone tired of the faulty pens. From 1948 to 1949 the price of a ball pen fell from 12.50 to 0.50 dollars. 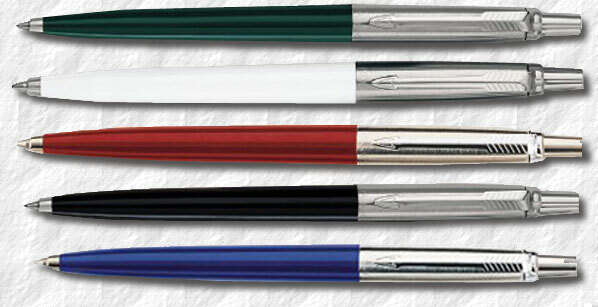 Eversharp sued Reynolds for breach of the patent laws, but since the patent was never actually filed in the United States, the law suit was thrown out. In 1951 Reynolds went bankrupt. The same year Parker won this year's design award – for a fountain pen, The Parker "51" a pen destined to sell in millions . While Parker initially fell for the ball pen frenzy and started test production of a low class ball pen manufactured under the name Parket, this project was soon halted. arker seemed reluctant to make ball pens and this seemed so strange that Time Magazine in 1946 had an editorial where they contemplated why Parker was napping in the midst of the ball pen boom. This led Kenneth Parker to make a statement in a letter to the magazine that he resented all such nonsense. Kenneth Parker had learnt from his work with the Duofold, the Vacumatic and the Parker "51" how important it was to be really creative and innovative. Only by offering a truly great product would one be able to stay in business. slowly in the middle of the ball pen hysteria, in 1954, after nine years of research, presented their own version of the ball pen, the Jotter. In functionality it far exceeded everything produced until then. It differed in several aspects from Birós, Reynolds and Eversharps pens: it wrote five times as long, it was easy to refill and it came with a choice of nib sizes. A fantastic collection of First Year Jotters, 1954. Note the lack of the metal nib protector. ow about Biró then? Well, General Motors brushed the dust from his gear-patent and by 1940 they started producing Buicks with the new (enhanced) automatic gear box. Biró never got anything more from GM than the initial payment. And had it not been for Reynolds killing the pen market, perhaps Biró, who died in 1985, eventually would have been granted his patent for the United States. It would probably have made him one of the most successful entrepreneurs of that century. So, no, Biró didn't like the American way of doing business much. arker continued to produce the Jotter for more than fifty years and it is still in production, still with features borrowed from the original Biró patent. The first 1954 Jotters were made from striped/ridged nylon, rather than plastic and came in the colours of black, grey, red, orange and green. There was also a Flighter model (referred to as the "custom") in all steel. 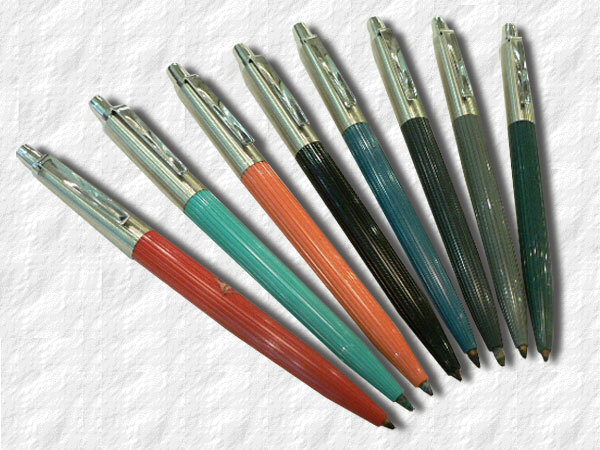 The first pens didn't sport the arrow clip, but rather a plain clip previously found on some Parker "21", the "V clip" or "trough clip". Also they did not have the metal barrel tip of later models. They all had stainless steel caps with brass threads and was fitted with a new button actuator that besides hiding and showing the nib also rotated the refill thus inking the ball evenly from the inside. This had the additional advantage that the ball was worn evenly. Other pens simply stopped working when the ball became oblong, while the Jotters ball got smaller, but was still round. The new pen cost $2.95. y 1955 the Jotters were all made in plastic without the ridges. Late 1955 Parker began to add the metal tip to the barrels to prevent cracking. They were offered in the same colours as the previous year. In the UK Jotter "51"s were produced in solid in either 9 or 18 carat rolled gold (Gold Insignia) and rolled silver (Silver Insignia). n 1956 the clip, still in the same manner as the clip of the Parker "21", was inverted, referred to as the "Inverted V clip" or the "Ridge clip" it still did not have the Parker arrow. In 1958, at last, the Jotter got full Parker status and an arrow clip was fitted to the pen, it was of the same design as the clips found on the Parker "45". This design was virtually unchanged until 1972. In 1962 a cap actuated Jotter "61" model was introduced. In 1965 Parker offered a desk pen in black an brushed chrome. By 1973 the button of the Jotter was redesigned. While the previous years had seen a lightly rounded button, it now became flat, sporting the Parker logo. (demi 4.5 inch, demonstrator, Arrow Jotter "45", Pardner, International Flighter, lunch room specials, Tiara 67-69 in black turqoise. orange (green? ), Royal Wedding Jotter, 2004 50 yrs Jubilee Premier Edition licorice black, saffron yellow) Intro jotter pencil, roller balls, fountain pens. Special thanks to Henry Gostony, David Shepherd and Stuart Schneider.